AZ Goat Yoga Attempts "World Largest Goat Yoga Class" Right Here in Mesa! AZ Goat Yoga Attempts "World&apos;s Largest Goat Yoga Class" Right Here in Mesa! In celebration of the first-ever National Goat Yoga month, AZ Goat Yoga will be attempting a world record of the largest goat yoga class! Come join us to witness this monumental event on Sat, Feb. 23! When and where is this world record attempt? This event will be from 9:30 a.m. - 11:00 a.m. on Sat, Feb. 23! 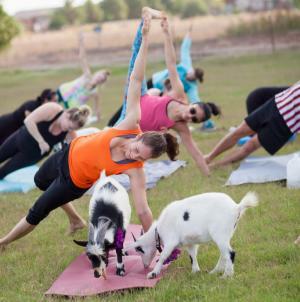 Goat Yoga is like your ordinary beginner&apos;s yoga class, but with a little extra weight and cuteness added to it! Not only is adding goats to the class challenging, but it also adds fun and excitement to your basic workout routine! 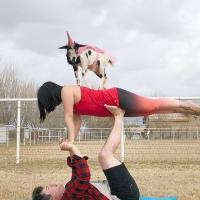 So how does "goat yoga" work? Well, these goats are specially trained to interacts with guests while they proceed to hold (somewhat simple) yoga poses throughout the class. You and your workout buddies will surely be amazed as the goats balance on your backs and weave through your legs! The world record attempt on Feb. 23 will be instructed by Sarah Williams, a certified yoga instructor, and April Gould, the "Goat Whisperer". The class will include over 75 goats and up to 350 participants. The workout routine will last around 30 minutes and all partakers and goats are expected to be fully active and engaged the entire time! Must be 18 years or older to participate in the world record attempt. No spectators allowed, only participants. Participants are asked to wear plain, bright clothes with no logos on them. Yoga mats will not be provided so bring your own! Be fully aware that you will be filmed and photographed during the event. Leave all personal items at home or in your car, it will be crowded! Be there early to save a spot and set up! Tickets are $15 and must be purchased ahead of time by visiting their website. No drop-ins allowed! See what others are saying about AZ Goat Yoga! To learn more about the event, contact Sarah Williams at (480)-201-9520. For media inquiries and other information, contact Visit Mesa PR Team Lead, Michelle Streeter at (480)-650-5171 or michelle@visitmesa.com.